Kidlet has a shamrock dinner roll, soy ham and manchego cheese on little leprechaun picks. On the side are grapes, strawberries, and oranges. 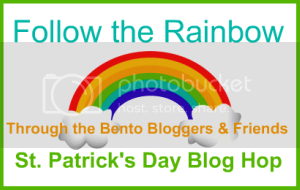 Need more amazing St.Patrick's Day inspiration? We're doing another super fun blog hop! Head over to Family Fresh Meals for a super adorable creation! Then follow her link to another great blog and so on! 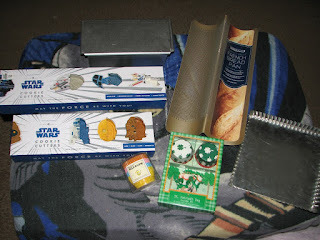 For all my loot lovers out there, here's what I got at Williams-Sonoma! 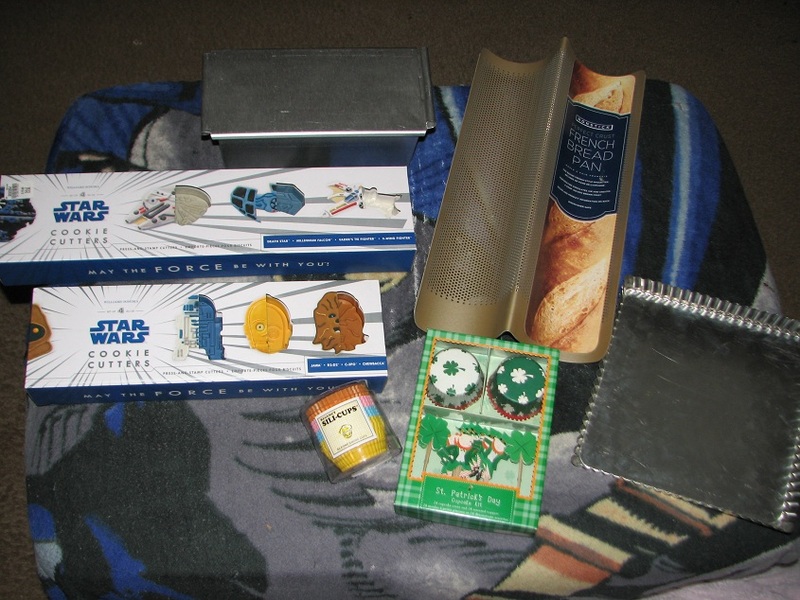 A pan de mie bread pan, two sets of Star Wars cookie cutters, some silicone baking cups, french bread pan, tart pan, and St.Patrick's cupcake set! This one has nothing to do with anything else but it's my favorite picture ever. 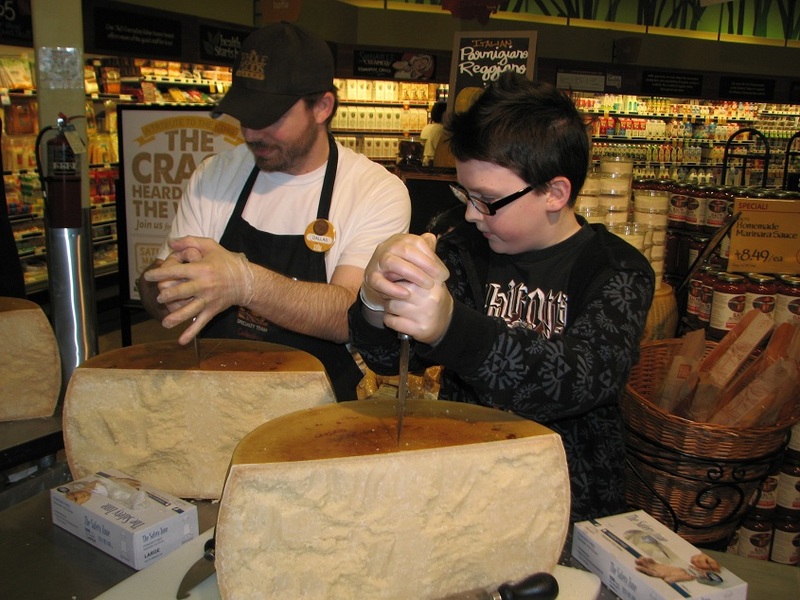 On Saturday Whole Foods wanted to break a world record by snapping open a ton of huge parm cheese wheels. After the initial crack they let Kidlet help! He was in giant cheese heaven! Great lunch! Looks yummy and fantastic. 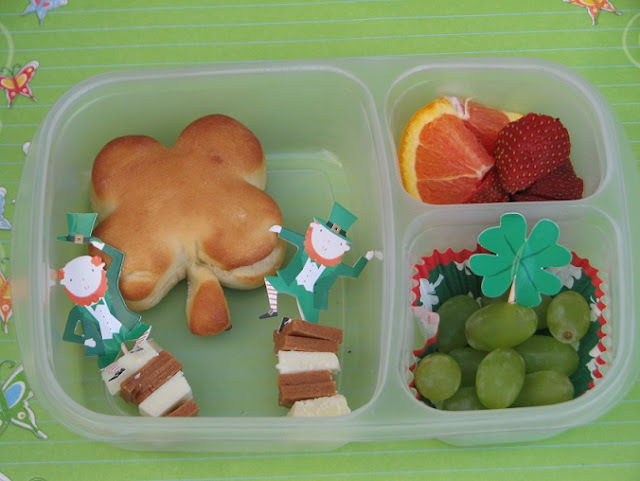 LOVE the shamrock dinner roll, and lil leprechaun picks..super cute lunch! I love the dinner roll in shamrock shape and your cute leprechaun picks! Loving the fun lunch! I can't wait to come home to USA, Williams Sonoma and Whole foods are my favorite stores ever! Happy Birthday indeed! I hope your birthday was wonderful! how did you make the roll? did you use a cookie cutter? I love it! Totally cute. LOVE the shamrock roll, so unique! That dinner roll is too cute! Kristie yes I used a cookie cutter with my favorite dinner roll recipe :) very easy! Love the roll! Hope you feel better soon! I agree... those picks are super cute. The shamrock roll is amazing! Love the shamrock roll. I used the same W-S picks and cups :) Good taste! Fun lunch AND fun loot!! !